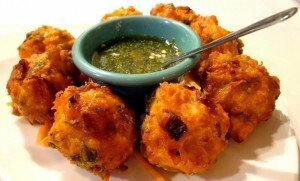 Shrimp Pakoras recipe by SumeraNawed at PakiRecipes.com. Put the yogurt in a bowl and sieve the gram flour and keep aside. Stir in the mustard powder, chili powder and salt and mix well. Sqeeze lemon juice of the ½ lemon in the baisan yogurt flour mixture. Peel, chop and paste the onions and mix it with the batter. Put the batter in a bowl, cover it and refrigerate for 2 hours. Drain the fried prawns on tissue or any paper so as to remove the excess oil.